I'm nowhere near ready to write a real post on it, and the game itself hasn't happened yet...but I am seriously having the time of my life and I had to give you a taste of the excitement. I feel so appreciated as a professional. This trip is beyond words! 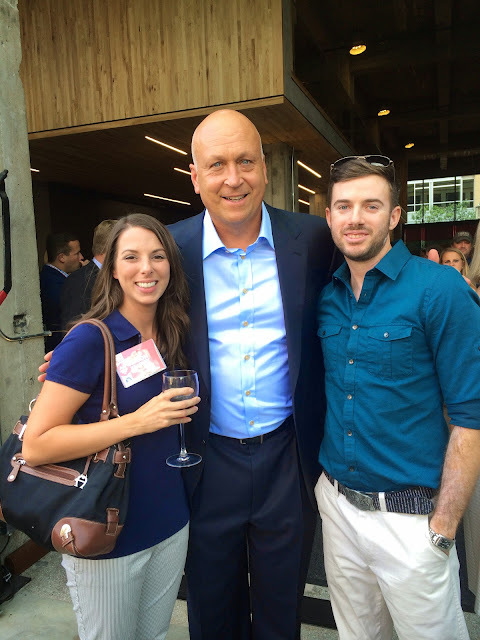 Yes, that's us with Cal Ripken, Jr.! Today the amazing honor culminates as the 30 of us are honored on the field pre-game. So tune into ESPN or MLB network for the All Star pre-game show to catch a glimpse. I'll be the one crying and trying not to fidget! I can't wait to fill you all in on everything that has happened. Until then, THANK YOU if you helped me get here by voting! Yay!!! I caught some of Mike & Mike on TV this morning and thought of you! So glad you're having a blast! Yeah, it's definitely a little weird to get this kind of treatment. Lord knows we teachers aren't used to it! People bash teachers so much, it is wonderful that you are feeling the appreciation you deserve this week!!!!! Seriously. I kept wondering why it's a big deal that teachers rarely receive accolades - plenty of occupations don't - and then realized it's because we're so used to receiving the opposite: disrespect and abuse. I was totally emotional and thinking of ALL my blogging-teacher friends the whole time!